For its 2019 intake, the Afrox Leadership Academy has grown its student numbers by more than 50%, now accommodating 25 students from five Windhoek Schools. In addition, the company has launched an Alumni group for former students. 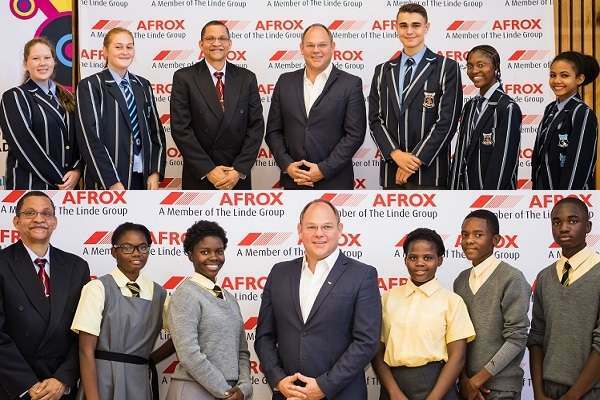 The new intake was officially welcomed earlier this week by the Managing Director of Afrox Namibia, Eckhardt Vorster and the Director of Education for the Khomas Region, Gerard Vries. “We designed a programme that would help young people realise a new world of possibilities and provide them with the tools they need to achieve their dreams,” said Vorster when he addressed the students. “Instead of only granting bursaries, which we believe is very necessary, we opted to develop a skill that at present is mastered too late in life,” Vorster said adding that it is well documented that building leadership at a young age, encourages responsibility, develops a positive mind set and teaches organisational skills, which eventually allows the learner to become a more responsible and engaged citizen. The prospective students had to provide an endorsement letter from their Life Skills teacher supporting their application, and attend a one-on-one interview with the programme coordinators as part of the final selection process. The academy programme covers a broad range of topics such as purpose, decision making, career guidance, basic etiquette, project management, presentation skills and many more subjects which fit various interests while still providing a solid foundation on the principles of leadership and self-governance. The sessions are a mixture of lectures, professional one-on-one mentoring, site visits and community service. The programme stretches over a period of six months with a one-week Leadership Training course for further interaction and teamwork. Chairman Mao Zedong Secondary School: Adeleke Kaloia (17), Ailly Nuuyoma (16), Joakina Endunde (16), Raymond Semango (16) and Silva Lopes (17). Concordia College: Hans Mwiiyale (16), Cristo Eduardo (16), Eva-Rakel Johannes (16), Ileni Ngenomesho (16), Jonathan van der Westhuizen (16) and Unovandu Tjavara (16). Delta Secondary School: Ama Geingos (16), Jemimah Ndebele (16), Patji Tjiroze (16) and Tanyaradzwa Master (15). Hage Geingob Secondary School: Amukoshi Festus (16), Hilde Haipinge (16), Junias Frans (16), Victoria Mathias (16) and Tuyeni Akwaake (16). Windhoek High School: Christine Mukumbi (16), Jana Hein (16), Nadia Horn (16), Richard von Schultz (16) and Suzie van Zyl (16). Caption: The Director of Education for the Khomas Region, Mr Gerard Vries (top, centre left) and the Managing Director of Afrox Namibia, Mr Eckhardt Vorster (top, centre right) with the five successful learners from Windhoek High School and in the bottom picture, the learners from Hage Geingob Secondary School who were selected for this year’s Afrox Leadership Academy.